We off a service that transforms your current wide range pickup into to vintage spec wide range. 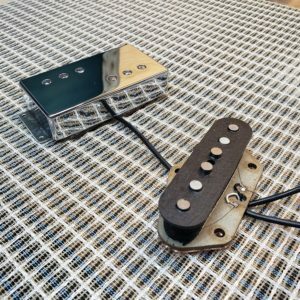 We gut out the newer historical incorrect humbucker parts and add vintage size wide range bobbins that can hold the correct vintage size coil wire. We also use threaded pole magnets and the steel plate you find on the original wide range pickups. The pickups are wound up to vintage spec. By default, we wind the neck a little less than the bridge to balance things out. You’re welcome to suggest your own specs. We can use 4 wire lead or vintage pushback. Don’t worry, your current covers will fit our mods just fine! We do not have cunife magnets. Those magnets will probably never be manufactured again. The magnet industry has came along way since cunife and it will be never economical for any magnet company to manufacture them. Sorry we went on and on about this but we get asked about cunife all the time. We use an alloy composition closer to alnico. We gauss or threaded magnets to the same strength as the original cunife for the same result in magnetic performance.